I knew LOVE brides were going to adore Made with Love dresses as soon as I saw them, however, I had no idea just how much you were going to adore them. The first four dresses we stocked just wowed our brides, so the demand for more choice was completely unprecedented. You’ll be pleased to hear we now have a 16 strong collection (and counting!) not to mention lots of beautiful veils and an overskirt too to style them with! You may have seen some of our fantastic new dresses being treated to the sights and sounds of Altrincham during our glamorous photo shoot, but if not, let me introduce you to Riley. She is the dress that dreams are made of. Available in two equally beautiful types of lace, boho and luxe, with a deep, plunging neckline, she creates a swoon worthy, dramatic silhouette. Our love for Enzoani dresses is deep. We have been watching brides try on these detailed, highly crafted, luxurious gowns for years, and the moment they look in the mirror and see the picture-perfect bride staring back is one of the reasons it’s a joy to do my job. We have welcomed seven new dresses to LOVE, most of which have arrived already, with a couple more still to come. This sleek full-length mermaid gown features a classic strapless sweetheart neckline on an unlined bodice with beaded, embroidered lace. Matching lace continues throughout the soft stretch georgette skirt and down the length of the tiered tulle train for a dramatically chic look. Gorgeous floral embroidered lace paired with the softest tulle is the stand out feature of this full-length mermaid gown. Delicately beaded spaghetti straps frame the deep sweetheart neckline, with an illusion bodice, low illusion keyhole back, and simply stunning, two-tiered tulle train. This stunning, full-length gown featuring floral corded lace on a beaded illusion bodice with plunging neckline, is just divine. The soft and sleek stretch georgette skirt hugs the body, gorgeously flaring out into an ethereal tulle mermaid skirt with horsehair hem, perfect for a modern romantic. An all over lace mermaid gown over an unlined, strapless sweetheart necklace bodice makes for a sleek and chic statement. The delicate, scalloped hem lace of the skirt along with the invisible back zipper close are luxurious and elegant details. A timelessly, elegant A-line gown made of the softest stretch georgette and adorned with embroidered, all-over lace cascading to the full-length train. The plunging V-neckline matches the low V-back, while a thin beaded belt cinches the waist and flatters the figure. A stunning fusion of embroidered lace, corded lace and Chantilly lace create an exquisite masterpiece. The unlined, strapless sweetheart neckline bodice flows all the way down to the showstopping illusion lace train with a scalloped hem. A very different look for a modern bride, this full-length gown features a mermaid dress underneath a dreamy, detachable A-line skirt with sparkling beaded belt. Throughout the dress, beaded embroidered lace and 3D floral motifs show off the sequin embroidered tulle highlighting the incredible artistry that has gone into making this dress. 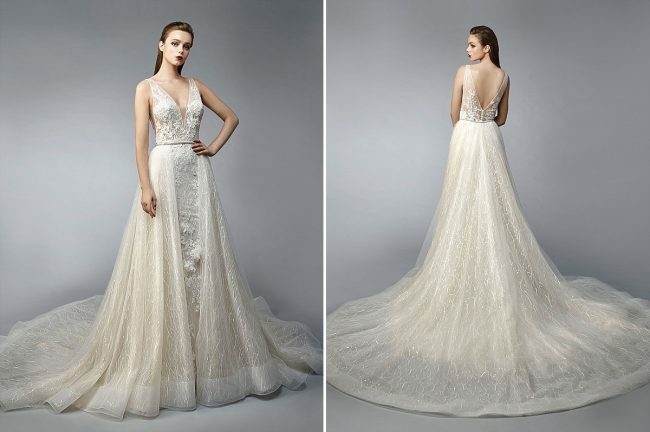 We will be holding our first Enzoani Trunk Show featuring the 2019 collection on Saturday 1st December. Please ensure you put your name down asap for this event, as I know, with dresses as beautiful as these, our appointments are going to fill up fast. Email hello@lovebridalboutique.co.uk for availability. The beautiful 2019 Enchanted Collection from Sassi Holford is inspired by nature and romance and focuses on texture and light. It was so difficult to choose just six gowns from this fabulous collection. We also had the honour of hosting the illustrious designer herself for a Designer Day at the end of October. 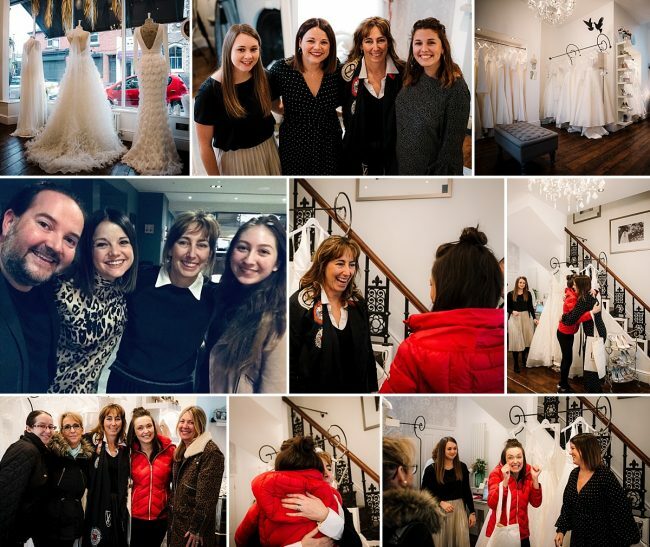 Sassi was on hand to style and advise those brides who had been quick enough off the mark to book an appointment. 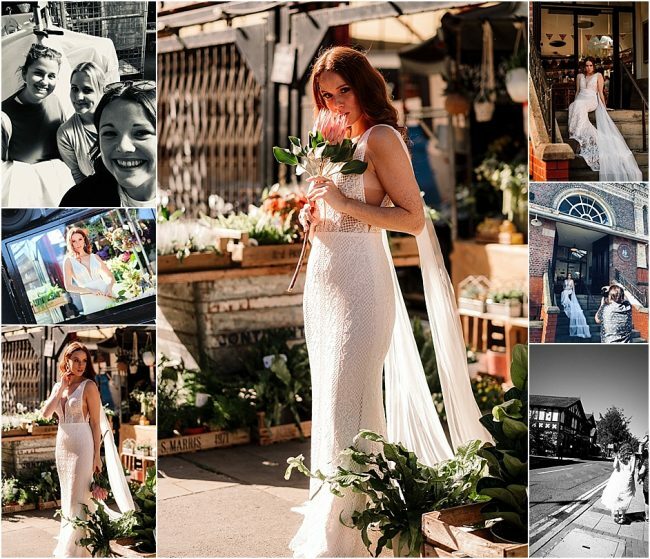 Thank you so much to Sassi for coming to LOVE, it was such a pleasure to have her with us and our brides adored her! This modern, striking column dress with a high neck contrasts perfectly with a low open back. Made from the highest quality silk crepe, its high neck and long sleeves create an elegant and dramatic silhouette. Perfect for a winter wedding. The soft flattering cowl scoop neckline of Alana, with beautifully draped V-back detail is created in stunning fine lace. Complimented by the soft fit and flare crepe skirt, Alana is a classic with a twist. The simple clean lines of Giselle allows the bride to shine. The floor-length gown is strapless with a band detail around the waist and a princess line skirt made from exquisite silk satin. Sienna is a classic column gown with deep V-back and straps. Her simplicity makes it perfect for accessorising, so a bride can add their personal style to the dress. A beautifully simple and elegant halter neck gown with a crepe bodice and organza ball gown skirt. It is finished with a dramatic, floor-length necktie that can be tied in a chic and modern organza bow, making a beautiful and unexpected statement as you walk down the aisle. I hope my preview of the 2019 collections arriving at LOVE has completely blown your socks off! I know I’m personally in awe of the beautiful designs and the incredible craftsmanship of these stunning gowns. 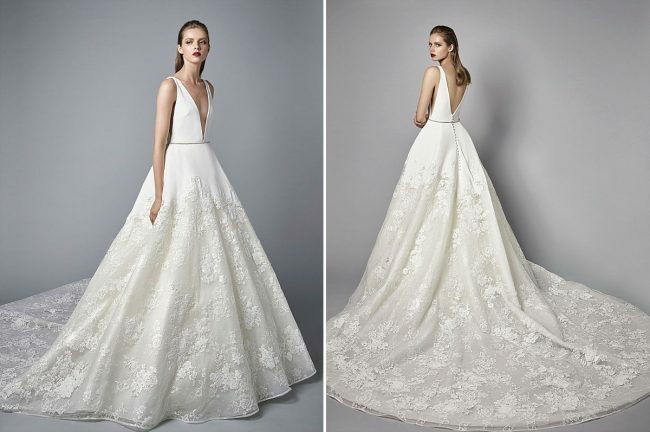 If you have your heart set on one of these fabulous dresses, get in touch today to book an appointment or, to be the first to find out about our Trunk Shows and Designer Days follow us over on our Instagram for all the information you’ll need!